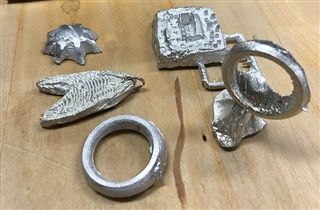 Students in David Miller and Tim Rice’s Design and Fabrication class have begun to experiment with metal jewelry casting, combining a traditional process called cuttlebone casting with 3D printing techniques. According to Mr. Miller, they’re still in the beginning stages of this process and are looking to use 3D prints more directly in the process to improve quality and detail in the finished pieces. Since it was first introduced as an independent study in graphic design in 2016, this upper school elective has expanded to include 3D and product design. Over the last few years, students have designed and 3D printed smartphone cases and containers, designed and built Bluetooth speakers, and used silk screening and vinyl heat press techniques to create custom t-shirts.